A young woman is searching for her way of life – as she is feeling rather insecure, she makes up rules for every little detail – but life is not made for following rules; or rather: rules have to be adjusted to life all the time. While following the narrative through her partly amusing, partly desperate search for self-confidence, the reader is captured by the female narrator’s voice conjuring up a lyrical world of language, rich in universal incantations and existential longing. Reglerna was nominated for the August Prize and won the Borås Tidnings Debut Prize. Sara Mannheimer grew up in Gothenburg and has studied in the USA, the Netherlands and the Czech Republic, before settling down in Stockholm. Besides writing, she runs the glassworks “Stockholm Heta Glas”. Her novel »Reglerna« was nominated for the August Prize and won the Borås Tidnings Debut Prize. 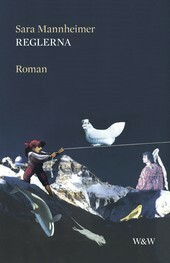 »Handlingen« received the 2012 European Union Prize for Literature.